I can’t begin to tell you how proud I am of all the fantastic items that you all produced during the Crafters Dozen promotion. The volume of wonderful garments, toys, squares and slippers that came in was HUGE! Thank you, thank you, thank you! 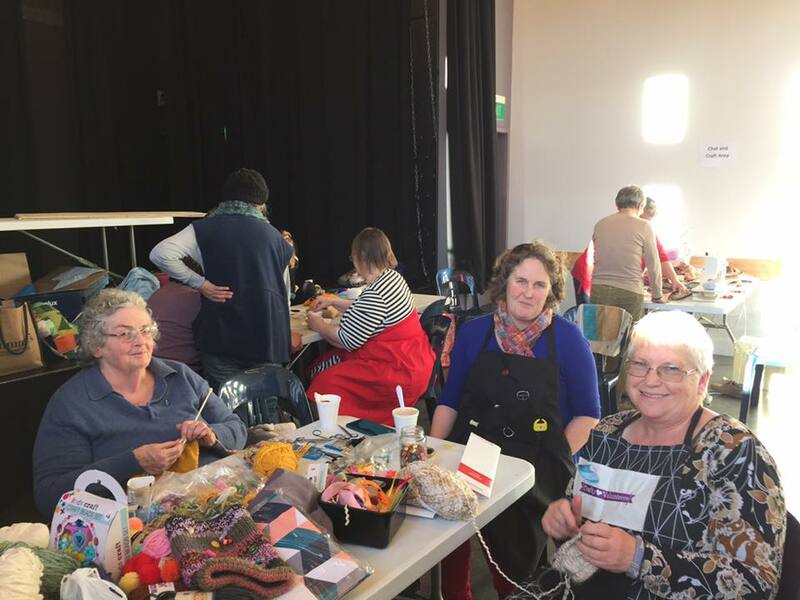 It’s nearly 2 months since our Crafters Dozen day at Newlands Community Centre, where over 120 people came along to spend some time with us at some stage during the day. Several people said their goodbye’s, only to show up again later in the day because they enjoyed themselves so much. 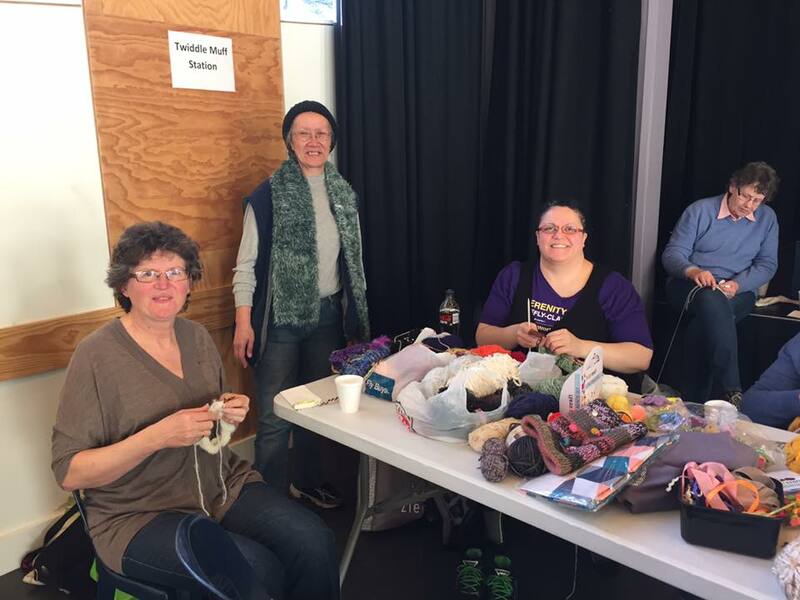 We taught numerous people how to knit and crochet, and we made some wonderful new friends. A few ladies brought along their sewing machines, which was awesome to see. It was a great venue – you might be able to see in the photo’s just how much the sun was streaming in on us. Thanks heaps to those that helped during the day – we all had such a lovely day, and I know that many of you are keen to do it again. It’s only now that the donation bins at our drop off points are managing to contain the volume received between collections. During the promotion and up until just recently, they were overflowing with goodness every time we arrived to collect. 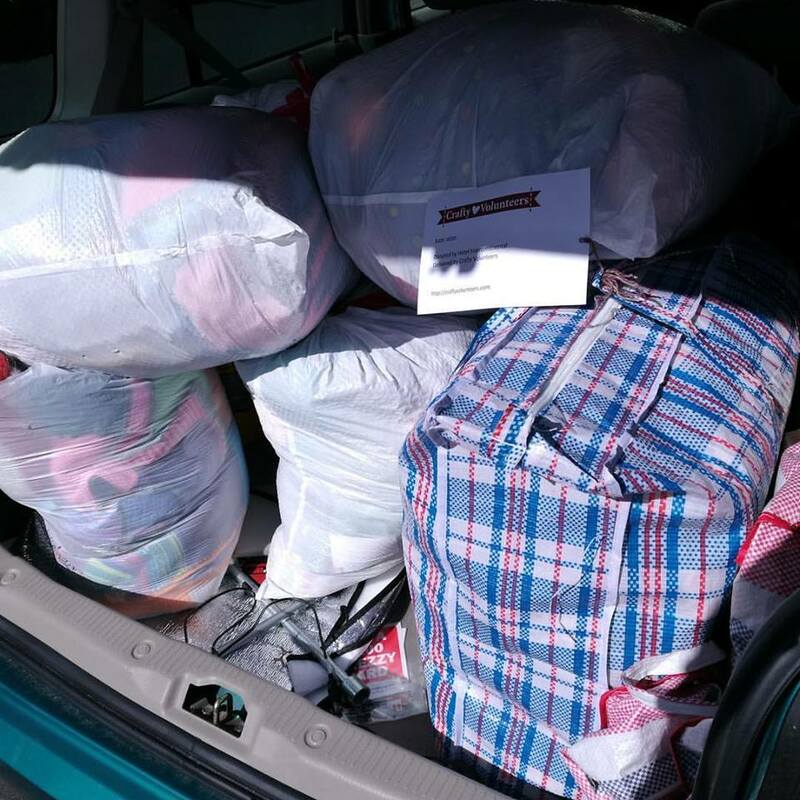 Anne and her helpers have had a wonderful time doing deliveries to the charities (check out the boot load of bags – and this was just one of several deliveries…). All of the charities express much gratitude to all of the crafters who have been donating. Once again – thank you! 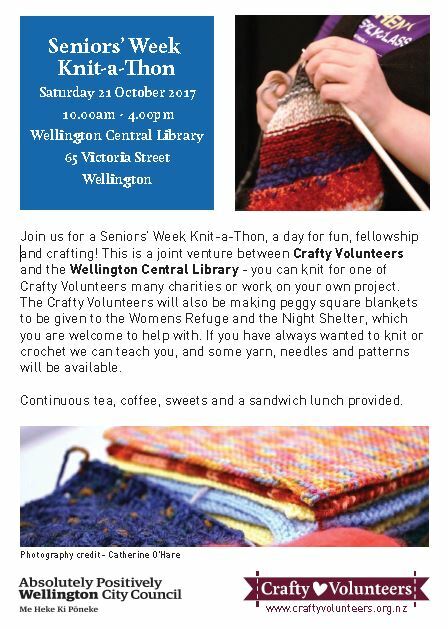 Wellington City Library have asked Crafty Volunteers to co-host a crafting event at the Library, as part of the City Council’s Seniors Week promotion, which we are delighted to be involved with. You’re all most welcome to come along on Saturday 21st of October, between 10am and 4pm, and join us making Peggy Squares and/or sewing squares in to blankets. We will be providing needles and yarn, and can teach people to knit and crochet. And the Library will have continuous refreshments, as well as some lovely treats. If you’d like to contribute something tasty for lunch or afternoon tea, it will be very much appreciated. 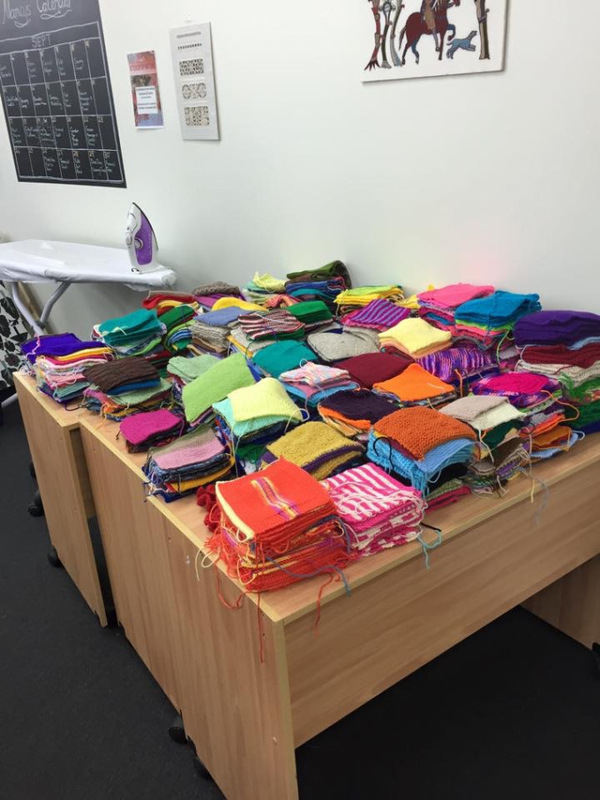 The blankets that are made will be donated to the Womens Refuge and the Night Shelters around Greater Wellington. So we encourage you to tell your “senior” friends and family about this event – we’d love to see heaps of people there. 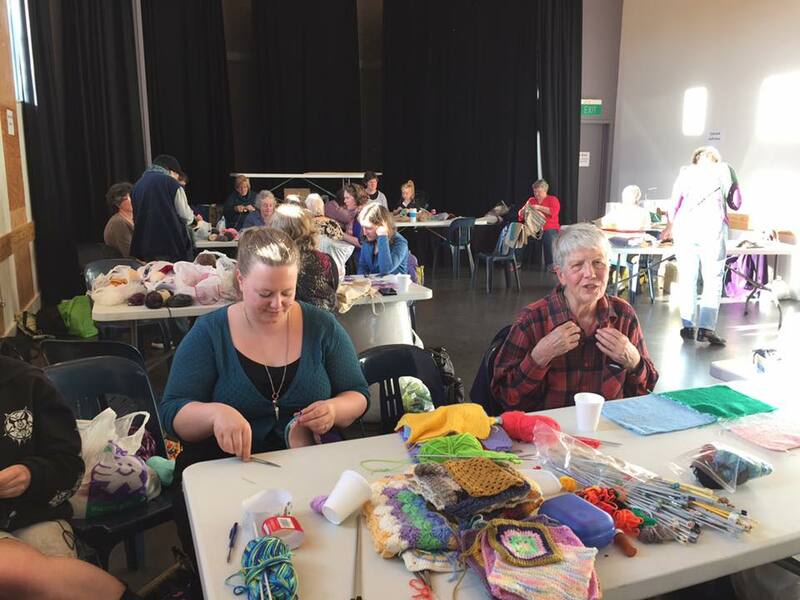 If you’re unable to make it, but would like to make squares to contribute to the blankets, please feel free to deliver them either to Wellington City Library, Lower Hutt Library, Tawa Library, or Nancys Stitch Studio on Thorndon Quay (remember to mark them for attention of Crafty Volunteers), and we will get them added to a blanket that gets made in the coming months. 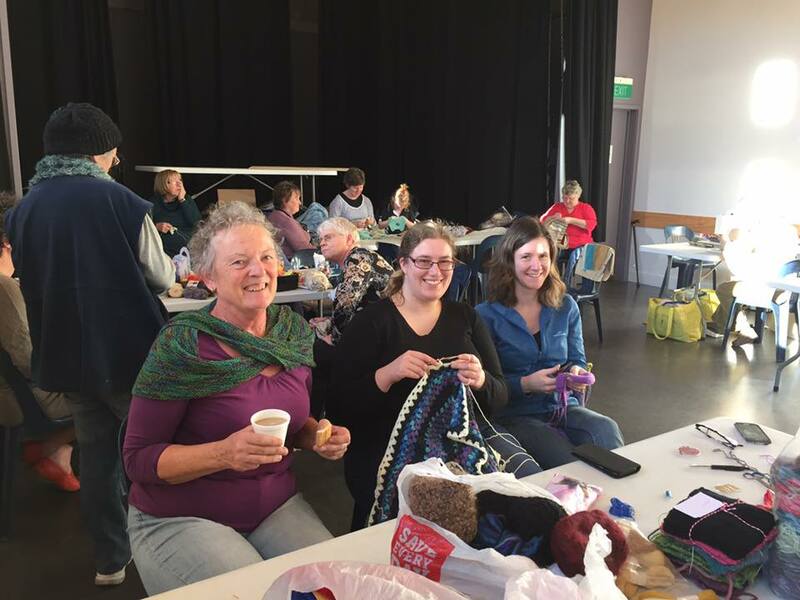 And if you’re interested in sewing (or crocheting) squares together, we are always looking for people to do this – we have a never ending supply of squares, and need for blankets. Please remember, if you’re making squares, the ideal size if 15cm. Many thanks! 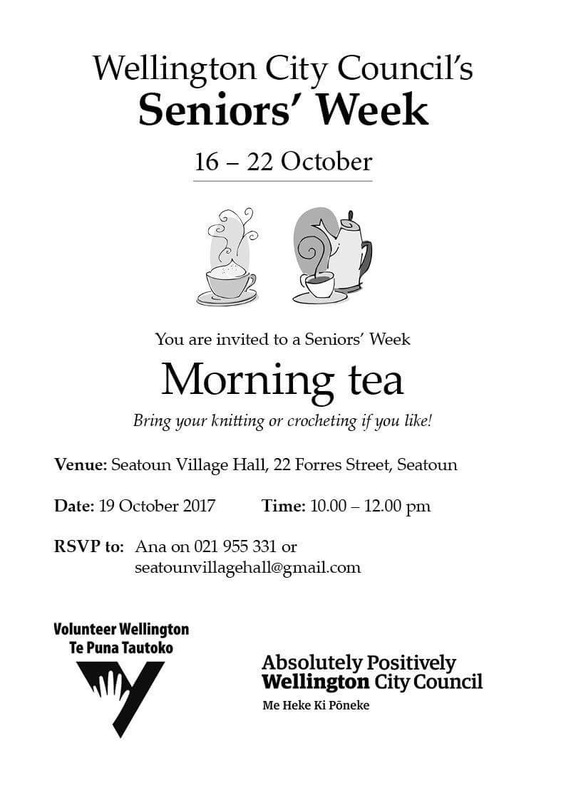 Also as part of Seniors Week, the fabulous team at the Seatoun Village Hall, cordially invite people to join them for their weekly session on Thursday the 19th between 10.00am – 12.00pm. This lovely team of crafters are loads of fun to be with, and will make you feel most welcome! There’s loads more going on around the City for Seniors Week, so check out the other awesome events that the Council are involved with – HERE. While we are all starting to think about our Christmas plans, and enjoying time with our families, some of our charity partners are putting together their Childrens Christmas packs for those that are unable to spend time with family over the festive season. 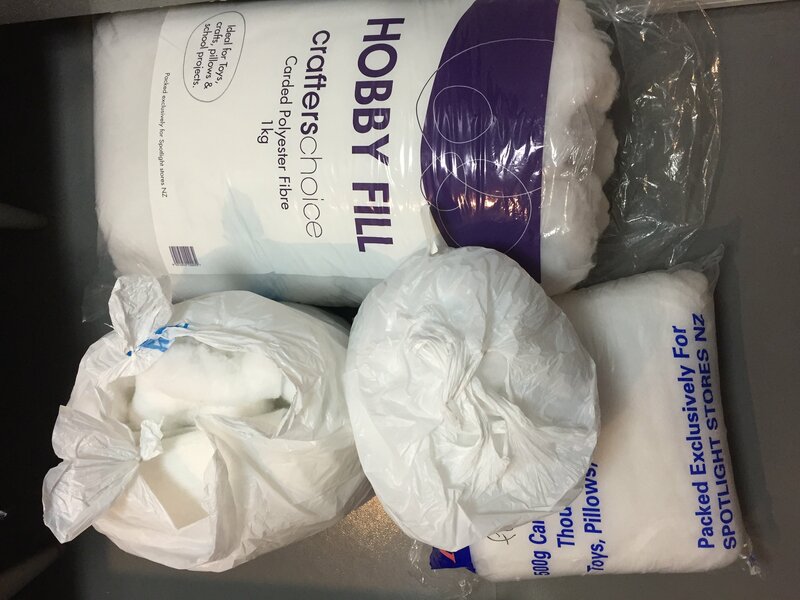 If you’re making toys, and need some stuffing, please let us know, we have a reasonable amount available. These items will be distributed to Foster Hope, the Womens Refuge, and to the Childrens Wards at our local Hospitals. I know that these charities will all appreciate everything that you are able to provide at this special time of the year. We will be delivering them to the charities around the 20th of November, so we would appreciate them coming in by around the 15th. 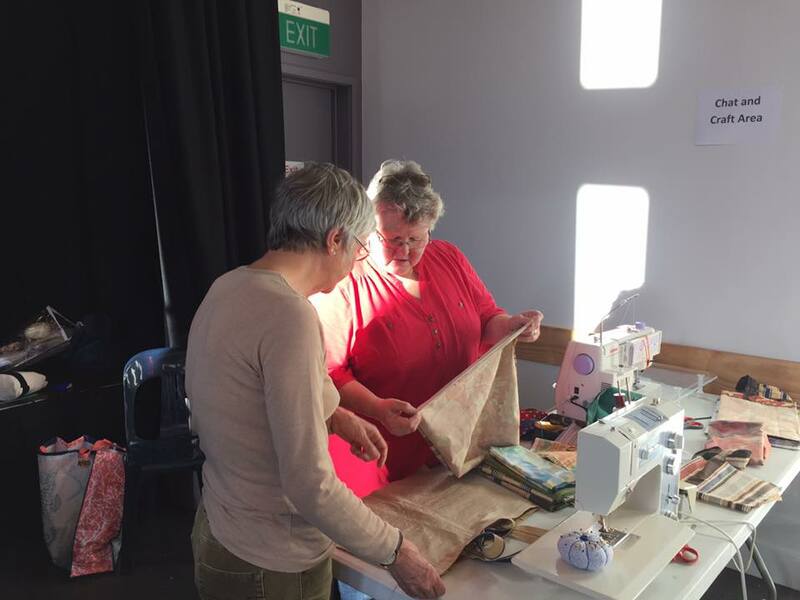 As always, feel free to deliver them to Wellington City Library, Lower Hutt Library, Tawa Library or Nancy’s Stitch Studio – and remember to mark them as being for Crafty Volunteers. We often have people asking “what do you want me to make?”, and our standard response is “whatever you enjoy making, or whatever new thing you’d like to try making”. 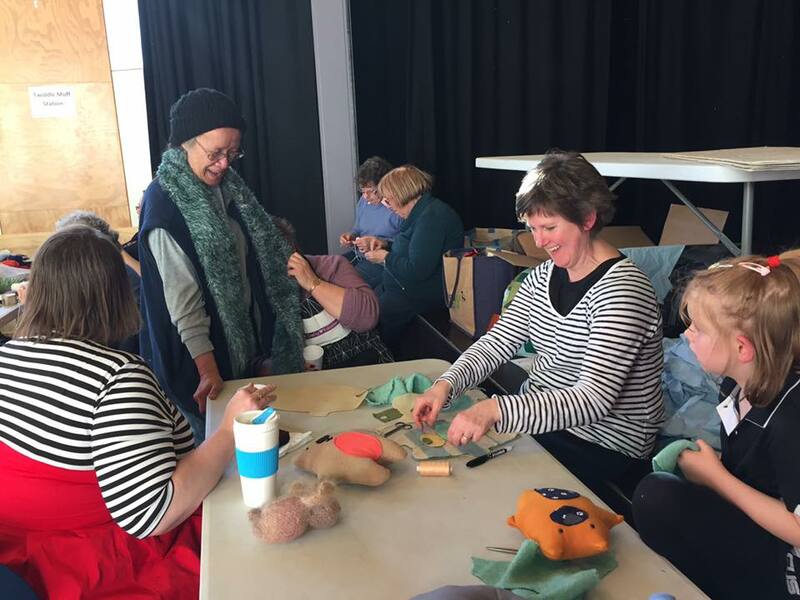 While at times people feel that this doesn’t answer their question, the reality is, there are so many charities that are in need of the wonderful things that crafters make. So we make a point of gathering up the goodies, and finding the most appropriate charity for it. When we do our deliveries to the charity, we check that the items will be useful, and if not, then we take them away and find another charity that can use the items. If the item is a little unusual, sometimes it may take a few attempts to find the most suitable recipient – and we always find a home for it! So if you’re ever feeling like you’re not sure what to make – don’t worry, just make whatever you enjoy. The main thing is that it will be made with love. Wishing you all a lovely rest of October – here’s hoping for some more beautiful sunshine.